Prior to our Italy Wine cruise, Chris and I signed up for a 2-night Pre-Cruise trip that included one night at the Podernovo Country Homes and touring and tasting at Castello delle Regine Winery. Castello delle Regine covers hilly terrain with views as far as the eye between Amelia and Narni, in the south of ‘Umbria. Its centennial history is linked to that of the various families that have lived in the possession of this land. Ht in the 400 that make up the property take turns vineyards, olive groves, farms Chianina cows, forests, gardens, a Relais Restaurant and 4 swimming pools. For over 20 years the current owner has maintained extensive investments, taking care of the old vineyards of Sangiovese Grosso and Merlot, choosing carefully together with the winemaker, Dr. Franco Bernabei, land for new plants. The care of the vineyards and olive trees is made in respect of the environment with the use of natural fertilizers, while the 200 ha of forests provide a high oxygen input in ‘air. The philosophy is “the best wine from the best land,” ensuring that every step from production of grapes for wine-making uses natural techniques. The harvest is done by hand. Since the first vintage wines have received awards from both the Italian guides, Gambero Rosso, Bibenda from both Wine Spectator and Wine Spectator. We thought the tour and tasting was very interesting. The Merlot and Sangiovese was pretty good and after leaving the winery I wished I had bought a couple bottles of the older vintage Sangiovese. We were gifted a bottle of the Poggio delle Regine white and a 2010 Queens Poggio Rosso so at least I had something to remember. I do plan on buying the wines in the future. We had the kids over for dinner recently on a Sunday to talk about our upcoming trip to Napa. My son Nick and his girlfriend Bri will be joining us for the first time in the Valley. Since they have never been there we wanted to talk about the extended weekend. Prior to the kids showing up Chris started preparing dinner. We decided on ribs and home made baked macaroni and cheese. Since it was after 3pm we felt it was time to have a glass of white wine! I have a cooler in our pantry stocked with various white wines. 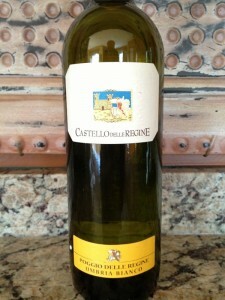 I started pulling bottles to see what we had and came across the Poggio delle Regine Bianco. It brought me back to the hot day at Costell Delle Regine. 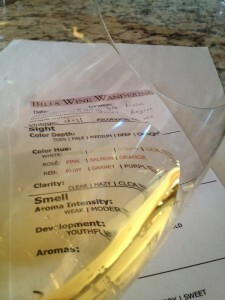 I grabbed my tasting sheet, pulled the cork and poured us both a glass of wine. The color depth was thin with a nice Amber hue. The Poggio delle Regine was very armoatic and fruity. We could smell Lemon, Banana, and Pear. Not dry or sweet. It was a very light bodied white wine. Our initial tastes the acidity was tart and there were no tannins. The Poggio dell Regine was flavorful with a medium finish. We could taste pear, and melon. We rated this wine two glasses. I think this wine would have been better served on a hot summer day. As I recall, when we drank it at the winery it was a lot fruitier. So if you have a bottle, drink it on a hot summer day.